(Bridgewater, N.J., Feb. 7, 2018) - The Somerset Patriots have signed four-time Frontier League All-Star first baseman Aaron Dudley. Dudley enters his first season with the Somerset Patriots and first in the Atlantic League. 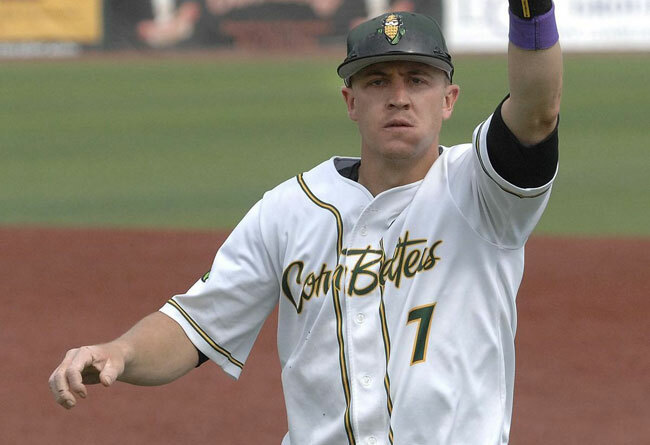 He brings with him a decorated resume from his time in the Frontier League with the Normal Cornbelters. There, Dudley earned four All-Star selections over his five seasons (2013-17) and became the franchise’s all-time leader in RBI (290) and doubles (120). Additionally, Dudley’s 57 home runs rank second in Cornbelters’ history (59, Pat McKenna). He has hit over .300 with at least 10 home runs, 60 RBI and an on-base percentage over .400 in each of his last four seasons as an everyday player, including a career-high .346 batting average in 2015. He finishes his illustrious Frontier League career with a .317 batting average over 394 games. The Toledo, Ohio native spent the first three-and-a-half years of his professional career in the Miami Marlins organization before he signed with Normal in 2013. Dudley played his college ball at Toledo University, where he still ranks as the program’s all-time leader in RBI (150). Dudley owns a .302 batting average with 69 home runs, 377 RBI and a .399 on-base percentage over his eight-year professional career.